We are also members of the SADC (Southern African Development Community). Consequently, you will have no import duties into SADC member countries. Click here for a very brief description of the SADC. And what's more, we will supply you with a comprehensive erection manual to assist you in your venture. But, it gets better: we're also accredited with the Southern African Development Community (SADC). you'll pay no or reduced import duties because these countries are all members of the SADC. Perhaps, Madagascar which was also a member – but was suspended from the SADC in March 2009 after the country’s president was forced out of office - will again come into the fold sometime in the future. Click here to read our very condensed outline on the SADC, titled 1 More Money Saving Fact. You should also take a good look at our pages About Concrete (fifth from the top on the left) to ensure that you do the initial stages of the erection correctly. Great care must however be taken to ensure that we understand your requirements so that we can supply the right structure and accessories for the purpose intended. Our DIY factory building kits have been developed to provide you with rapid deliveries at the most competitive pricing possible. This service is available throughout Africa via our Buildings In A Box System. You can of course construct your end walls using steel or brick construction; frame in doors and windows as necessary and get any finished look to suit your taste. 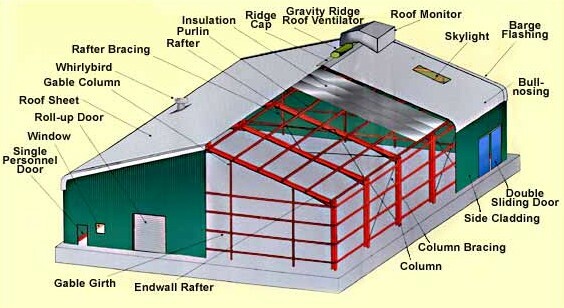 You can also use conventional insulation methods to insulate the building for heating and cooling efficiency. Each DIY kit comes fully protected with red-oxide primer. The water-based, environmentally friendly red-oxide primer is designed to protect the steel before it is erected. When properly applied, it holds up against all but the worst abuse (like allowing water to pool for weeks on un-erected parts). As a result, any exposed red iron inside your building will look good for years, and you can finish it to look even better. Every DIY building is made at our state-of-the-art factory – so you enjoy factory-direct savings. Dealing directly with the factory saves you time and money, and ensures that you get the lowest price available anywhere. Once manufactured, the building is then simply loaded into a container and shipped to you. 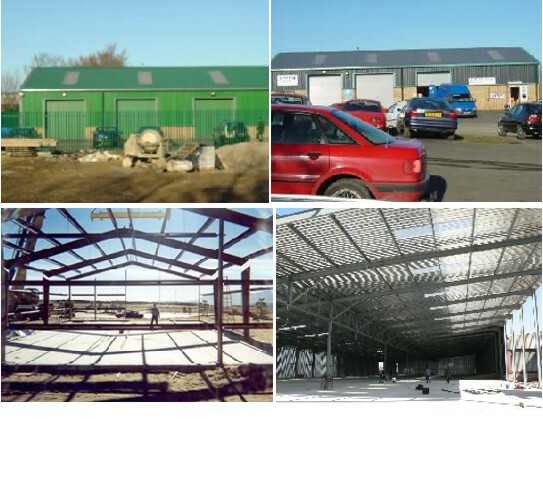 Our export buildings are individually containerized for delivery to any building site on earth. Each shipping container has all of the material needed to assemble the building in the field. 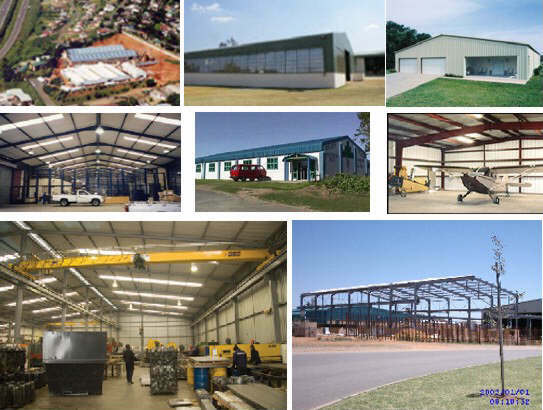 A building can be erected quickly upon delivery provided that a foundation is already in place and the necessary utility services set up onsite (when applicable). The unique modular structure also allows for rapid development and cost-effective expansion. Your steel erection crew will need to have appropriate tools available to complete the building assembly (but, it's not much - take a look at right!). If needed, we can even provide the necessary tools in the shipping container. 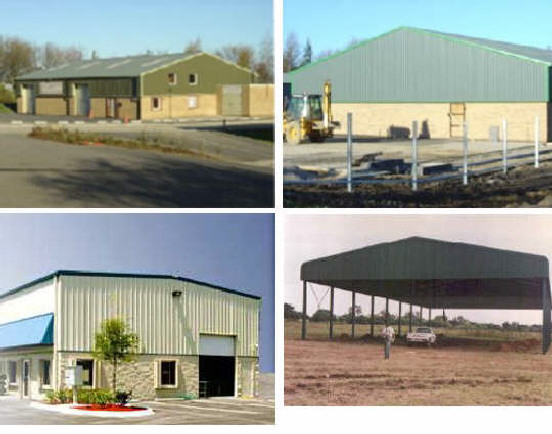 Our standard structures are supplied with 0,5 Full Hard Galvanised IBR Roof sheeting and all fasteners, including foundation bolts. And includes all the instructions needed for easy, simple, and fast erection. You can also check out a very brief slide presentation showing a building being erected by clicking here. - Egg packing stations, hatcheries and bio-security facilities. Please take some advice from us on the point of DIY kits. Don't just focus on price: focus on cost. If the first question you're asking is "how much is it?" you may be guilty of focusing on the price instead of the cost. Depending on how you want to use your building, the cheapest purchase price may not be the cheapest overall cost. (Price and cost are different!). For instance, our price includes the design, the drawings, and the materials for the basic structure. But the building will also need some type of foundation (see also page A Little Gem About Foundations), and its construction will require labour, some tools, and in some cases with bigger buildings, even a crane. After that, the project cost will depend on your finishes. As you add features like electrical, heating and cooling, plumbing, flooring, landscaping, etc., the costs rise accordingly. Apart from being able to house overhead cranes the buildings can be designed to provide additional support for the crane structure. We can also provide the additional steel for any building utilizing overhead cranes.